Today on Google throughout most of the world is a special logo to remember Howard Carter on his would be 138th birthday. The logo represents what he is most well known for, being an Egyptologist who discovered Tutankhamun's tomb. 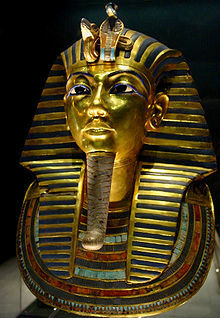 On November 4, 1922 he found the steps leading to Tutankhamun's tomb and then on February 16, 1923 he opened the doorway that lead to the burial spot of Tutankhamun, the Egyptian pharaoh of the 18th dynasty. It is one of the most recognized archaeological events. He died from cancer at the age of 64 on March 2, 1939 in Kensington, London, his birth place. There are stories told he died from a curse for uncovering the tomb. But in his case, it was not so. But these days, archaeologists wear masks to protect themselves from mold and other airborne issues. He was married to Lady Elizabeth Howard, daughter of Thomas Howard, 2nd Duke of Norfolk. I am not sure if he had children.